Rita Ora took to instagram this afternoon to share a number of pictures of her ensemble for day 2 of the V Festival. Where to start with evaluating this look, I am quite unsure. While pearls have been a woman's classic fashion decoration for as long as one can remember, we've never seen anything quite like this before. 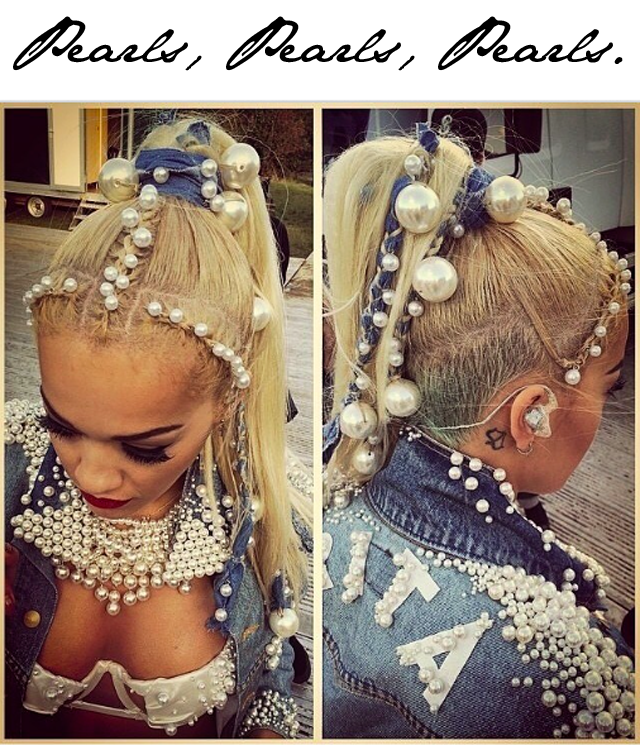 Rita Ora wears pearls in her hair, on her jacket (including her name written in pearls on her back), on her bra and straight down to the jeans. Oh, and she is wearing a pearl necklace as well. They are everywhere, spreading like a sort of decoration disease. Rita tells us this is a customized outfit from Katie Eary. It's certainly a "stop and stare" look, there is no doubt about that.